Ceramic rod sharpeners, also known as crock sticks, are completely different than bench stones. The rods are held in a vee at a predetermined angle, and the blade is brought down against them in a slicing motion. You can manually make deviations from the set angle by tilting the blade. Unfortunately most of these sharpeners come with only one grade of rods so they have limited use. An exception is the Tri-angle Sharpmaker from Spyderco. Their deluxe set comes with two pairs of ceramic rods, medium and fine, and a pair of medium diamond sleeves for pre-sharpening. A fishhook groove, a scissors position and a flat position extend the Tri-angle Sharpmaker for special uses. The Tri-angle Sharpmaker comes with a good instruction book. Lansky makes a handy folding ceramic rod sharpener called Fold-A-Vee. It folds for easy carrying and features two angle settings for fillet and hunting knives. There are a whole lot of gadgets on the market that promise easy sharpening. I have tried a lot of them in my quest. Theoretically with slot-type gadgets you just draw the knife through a slot a few times and it will be sharp. Many are worthless gimmicks, but some are worth considering. The most primitive type of slot gadgets uses a pair of tungsten carbide tool inserts set at an angle. A variation uses a set of overlapping carbide wheels. These literally scrape metal away from the edge, and leave a sharp, but somewhat ragged, edge. This type shapes the initial bevel but provides no way to hone or steel the edge. I bought one and it ended up in my junk box. Benefit from my experience and save your money. More refined slot gadgets use two sets of ceramic wheels or rods, one medium and one fine. This type hones well but is limited in its ability to sharpen. In the TwinSharp from J. A. Henckels these wheels are in the same slot. In theory you might use both in one pass, but in practice I found that changing your hand position changes which set of wheels contacts the blade. Knowing this, you can sharpen and hone separately. The TwinSharp is handy for touch-ups and I used it between regular sharpenings until I gave it to a friend. The FireStone 1302 Knife Sharpener from McGowan Manufacturing is also a two stage setup, but with sets of four interleaved medium and fine wheels, each set in its own slot. This makes it more convenient if the knife needs more sharpening than honing or vice versa. The Firestone would be especially handy if you own their electric sharpener, reviewed below. McGowan also makes a variety of other manual sharpeners marketed to fishermen and bow-and-arrow hunters. These feature additional tools like a broadhead wrench, fishhook sharpener and line cutter. Like golf spike tools and shotgun choke removers that are often featured on specialty knives, these tools are indispensable when you need one. I picked up a FireStone SharpPocket because it was winner of a product design competition. This is a single stage sharpener with only medium grit ceramic wheels. Instructions say to go light on the last few strokes to polish the edge. In my opinion the ceramic wheels are too coarse for a good edge, and they wobble. It has joined my junk sharpener collection. If you are going to benefit from a slot gadget, it must hone at an equal or greater angle than your sharpening. The Chef'sChoice Model 450 uses diamond stones at the same angles (22.5 and 25 degrees) as the final two stages of their electric sharpeners. I keep one in a kitchen drawer for use between regular sharpenings on my Chef'sChoice Model 110. For about $2, the Normark sharpener is a best buy. The Normark knife sharpener is an inexpensive slot gadget that can be found at a sporting goods store next to Normark's fillet knives. It has two sets of ceramic rods set at 20 degrees. The medium gray rods sharpen and the fine white rods hone. I have used it to restore a slightly dull blade to shaving sharpness. It costs about $2, so it surely is the Best Buy. The Normark's 20 degrees is perfect for touching up a fillet knife where the initial edge was 17 or 18 degrees. There is one class act in every category, and the Meyerco Sharpen-It is it for slot gadgets. Designed by Blackie Collins to be so simple that it could be used on horseback, the Sharpen-It features tungsten carbide wheels for the first stage and fine ceramic wheels for the second. The ceramic is so hard and fine-grained that it is more like using a steel. With this combination, the Sharpen-It performs well at both sharpening and honing. 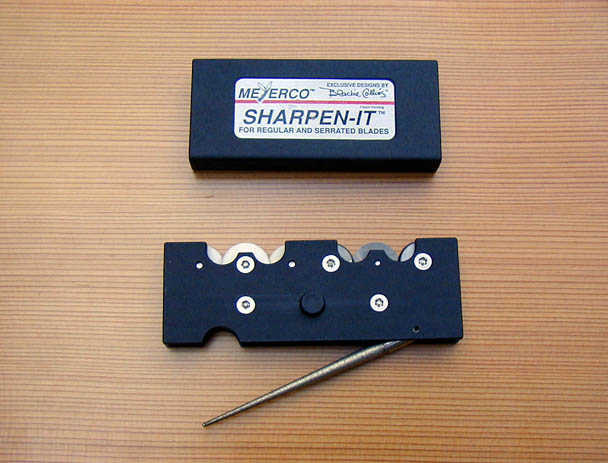 Unlike other slot devices, the Sharpen-It adds a third wheel to each set, giving two slots, and shapes them so that they sharpen one side of the blade at a time. This setup allows you to vary the bevel angle somewhat. Drawing the knife through at an angle decreases the bevel angle and gives a more razor-like edge. Since it is assembled with tamper-proof screws, I could not measure the bevel angles, but this information is less important because you won't have to use it with another sharpener to get complete results. Also unlike others, the Sharpen-It can be used equally well left-handed. It is so compact when closed that it can be carried in the watch pocket of your jeans. The unit well built and sturdy, and features a tapered hone for serrated blades. A less expensive model is available without the tapered hone. Cheap electric knife sharpeners such as those found on can openers grind aggressively but with little control of angle or depth. I've seen many knives ruined by them and they have given electric sharpeners a bad reputation. Here are two electric sharpeners worth considering for household use. The FireStone Diamond Electric sharpener from McGowan is a fast machine that produces a toothy, aggressive edge with just a hint of a burr. I prefer a more refined edge and the Firestone manual sharpener reviewed above is just the tool to refine it. The instructions don't say so, but the designer recommends pulling the knife through the wheels a few times with the machine turned off to align the edge, effectively using it as a manual sharpener. 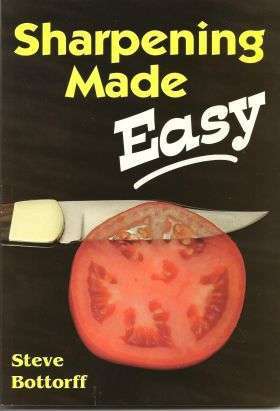 But this edge, right from the machine, will slice right through a ripe tomato while a fine edge may not. The manufacturer specifies 23-degree bevels on all their FireStone sharpeners, but I measured 18 to 19 degrees on the electric sharpener and 21 to 22 degrees on the manual sharpeners. The18-degree hollow ground edge would be another reason for the aggressive cutting. The FireStone manual sharpener would hone it to a longer-lasting angle. Note: there is no generally accepted method for measuring bevel angle of hollow ground blades. I like to measure the wheel diameters and spacing and calculate the angle at the edge by trigonometry. This manufacturer suggests measuring the average angle of the entire bevel, but that varies with blade thickness. My low number is the angle at the edge, and my higher number is the average angle for a blade with 0.020 thickness at the back of the bevel, typical of a hunting knife. The FireStone design features four interleaved, counter-rotating wheels like commercial machines, but without the adjustable angles that make the commercial machines so expensive. The wheels are 220 grit diamond-impregnated ceramic. I found it difficult to sharpen close to the bolster with the FireStone electric sharpener and, because it grinds so fast, you cannot play around much without grinding a swale into the blade. The instructions say you might need up to 10 passes on a new blade, but I found that every blade I tried was sharpened in a single pass and begin to show loss after only 3 passes. I suspect that repeated use of this sharpener would reduce knife life or require professional sharpening to re-shape the blade. I would prefer that this sharpener used finer stones and a slower speed. McGowan has updated the Firestone electric sharpener. It is now called the DiamondStone and comes with finer stones. My few uses of it indicate it works as well as the Firestone and produces a better edge. The Chef'sChoice 110 features three sets of diamond hones, and does a great job of sharpening. The Chef'sChoice is my recommendation in this class, with one caution - it has a tendency to scratch the sides of a blade, so I can't recommend it for collectible knives, but it is great for working knives. 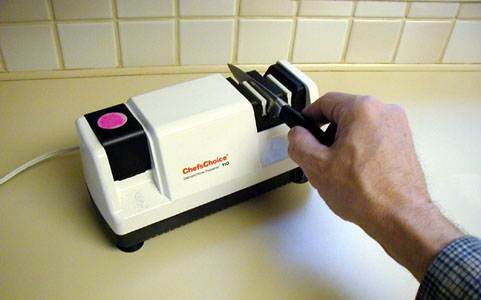 The latest Chef'sChoice sharpener is the model 130. It is identical to the 120 except the second stage has been replaced with a steel, giving you the option of having a steeled edge without mastering steeling. Guides make the task foolproof, and the steel segment is threaded so that as the small section you are using wears out you can turn the screw a notch to a new section. If you have a CC 110 or 120 and want a bargain upgrade, just buy the Chef'sChoice 470 SteelPro manual sharpener - the manual version of the CC 130 second stage.